The last line of this story was a typo, so I decided to go with the type-extra-letters to form a title. As I come to sit and write this autumn afternoon, there’s much to reflect upon from the last few weeks. I bought the 2 week trial for 30 bucks, and I rolled out my mat amongst the tightly packed room of yogis. If I am able to truly reflect, I can see that this moment was actually a big moment for me. You see, for years I did not step foot in a yoga studio. I started practicing at home around the age of 19 or 20, and then I didn’t step foot in a studio until I was about 28. Having a rare connective tissue disorder (Ehlers-Danlos Syndrome) left me feeling unsure, and actually scared: “Will the teacher understand my body? Will I understand my body?” I felt that my gut knew best, so I stayed away from trendy yoga studios, and found my place in the gentler ones. Since, I’ve completed my Yoga Teacher Training (where I learned how to listen to my body), and I spent the last few months in Taoist Summer mode (full of fire and energy): so I felt like I was finally ready to do this! It was Vinyasa (an actively flowing class). I’ve taken Vinyasa before, but this was Vinyasa with a handful of inversions and other upper-body weight bearing poses. The thing with EDS and yoga, or so it seems, is that: You’re fine during the class, but after…. Instead of a jam packed room, it was one other girl and myself. The teacher was helpful, but I noticed a trend at this trendy studio. My Kripalu yoga training was all about going IN, but I felt like all these ladies knew how to do was go OUT. Both classes were fun, both had great sequences, and both instructors knew a lot about adjustments. However, I walked out of each class thinking: “Were people seriously just trying to see Who Could Om the Loudest?” Oh well, I’m still learning something, still sifting, still collecting the gems. For days the pain radiated: it wouldn’t stop. As I write, it has been almost two weeks, and the pain is off and on. I blamed the “injury” on the handstand the teacher helped to spot me in. The handstand that I was so proud of for doing. The handstand that I received such a rush from. But always remember: what goes up, must come down. I went to the office with a clear head: no concerns, no fears, no nothing. A knock on the door, and a student doctor introduced herself and asked if I minded to have her see me first. I’ve been dealing with student doctors since I was 13 years old (I’ve seen the good, and the bad), and I know how it feels to be in training, so I gladly welcomed her presence. My third eye must have rolled back in my head, “Oh brother.” Why the hell did I get this MRA then? Well, I wasn’t very fond of the dye idea, so I’ll put that test off for awhile, until it is deemed: necessary! My doctor (whom I only saw a handful of times, and this will be the last), didn’t have much to add to the equation other than: a script to get an x-ray of my neck, a script for physical therapy 2-3 times a week for four weeks, and a snarky comment (snarky enough for me to think: “See ya! That’s all I need to hear from you!”). No one explained anything to me. I didn’t know why she came over and touched my neck, and why he ordered the x-rays. They didn’t explain anything, and they made me feel like I was asking too many questions. While in my car, the first thing I did was google the arteries. 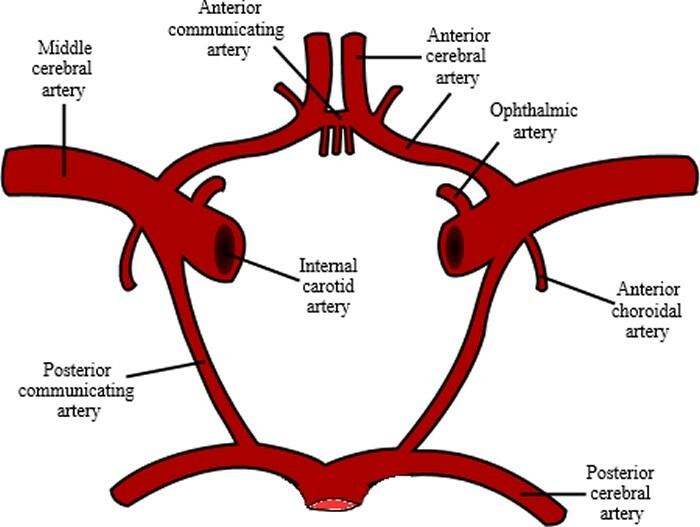 The posterior communicating arteries form the Circle of Willis. Instantly, “Bruce Willis is dead,” began to loop around in my skull. “The network of arteries supplying blood flow to the brain is more likely to be incomplete in people who suffer migraine, a new study by researchers in the Perelman School of Medicine at the University of Pennsylvania reports. Variations in arterial anatomy lead to asymmetries in cerebral blood flow that might contribute to the process triggering migraines. Once I got home I popped the CD of my MRA images back into my laptop. I looked through each image, trying to see where this absent left straight sinus would be. It appeared that everything was there, but I had no clue how to read this map, this maze. Unable to make any sense, I scrolled through the images to get a better glimpse of my cerival spine (my neck). (For some reason, my computer is stating ERROR when I tried to upload this photo. Ya know, again: My gut knew it! When I first looked at this CD a month ago, I thought my spine looked a little off: as if it were ramming up into my skull, causing compression. No wonder I blacked out when I did that Self test. I guess that’s why the docs knew to feel my neck, but why did neither one say anything about my neck? This compression is exactly where my neck pain stems from, where I told them it hurts! Why couldn’t either of them talk to me!? I should have listened, gutty. I’m sorry, gutty. But I’m not only sorry, I’m also paying. The following day, Thursday, it was time for one of Bhagwan’s visits. If you’re familiar with my writings, you already know that Bhagwan is a meditation master. He comes to America a handful of times of year, and creates an energetic space for us to meditate, and then liberate. During the meditation, I quickly realized that I was able to access that meditative zone much sooner than ever before. For the past month, I wasn’t meditating as often as I’d like, so I was happy to see this advancement. Once The Eye was positioned Upwards, the vibration turned to explosion, and I felt a continuous waterfall of energy stream from the top of my head over my whole body. I was shocked that this happened so quickly into my meditation. I instantly realized, I haven’t been doing that! Okay, let me get a grip on that practice. To shift your awareness back so that you are watching yourself takes lots of practice. Lots of focus. Lots of letting go. Lots of practice. Bhagwan spoke of “Losing Yourself into that Self,” the one that is watching the You. He spoke so poetically on this other Self (I’ll paraphrase, horribly): “Who are we when we let go of ourselves? Is that new “person” more real?” He described what it is like to be in that Reality. He made mention that this was the realm of Infinite Intelligence. That phrase perked my ears. This evening’s commentary was probably one of his best commentaries I’ve heard. Bhagwan even spoke about the planets, and the delicate balance they hold with each other as they move with each other. Being in such a meditative state while listening to him speak creates a wonderful canvas to explore upon the mind. His words about the planets painted across my imagination, and I felt what it would be like to be the planets in this beautiful dance with one another: The Cosmic Dance. It was a Magical/Magnetic Push/Pull feeling like few other. There are only a handful of occurrences in my life that felt so beautiful. I instantly flashed back to another Gurdjieff teaching about the planets, and this reminded me of a dance Gurdjieff choreographed. Whirling dervishes started to dance across my Visual Field. The Push/Pull Painting of Koi Fish I painted for My Spiritual Journey of Healing flashed as well. I became flooded with Soulmate/Twinflame-like waves of Love. I felt rushes of this Love often throughout this meditation. Sooo deep, sooo divine. The next morning I spent an hour in meditation in the dentist’s chair. I’ve come to the realization that the dentist’s chair is one of the best places to meditate. All of my recent physical realizations have not upset me one bit. I didn’t once think, “Had I known about this before. Had this. Had that.” I just flowed from one instance to the next. 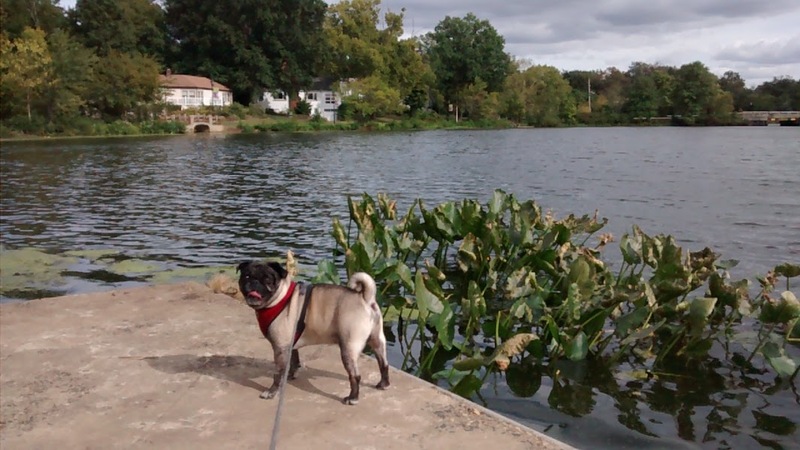 We set out and “We find it.” Yoda LOVES going to new parks: he just breathes it up. After about 10 minutes I didn’t know where to go, but I felt that I should look up for a sign. The exact moment I did, I saw a grey shape of a Heron come swooshing in over the water, but behind the trees that were along the water’s edge. As we walked over I realized there were so many amazing trees at this park. (I later found an old sign stating that they were all planted there long ago for the town’s 50th Anniversary). 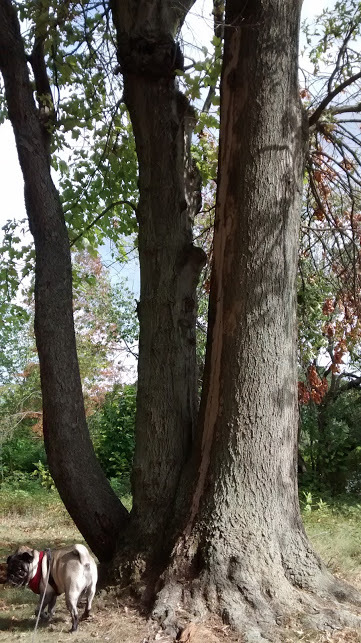 What seemed like one tree with three trunks, was actually a maple with two trunks and a oak with one! 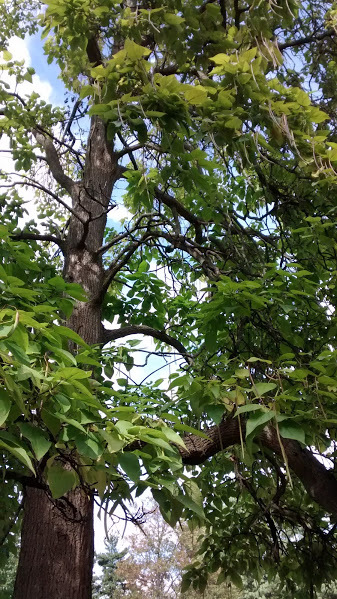 I enjoyed walking underneath the branches of the different species. It looks as if they are flying like that for fun, but they are zip-zagging for bugs! Yoda peered over the edge, and I reminded him, “Hey! Yodaaaaaa, stay back.” He looked back at me and laughed. I hit stop on the camera, and just as I realized that he had headed over to the back left corner of the dock, I heard this 29 pound KER-PLUNK! It was the funniest kerplunk I ever heard in my life. I didn’t see him go in, but that loud plunk will forever stay ingrained in my mind.